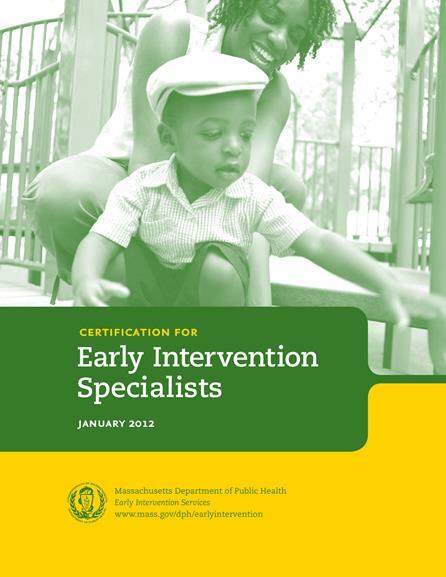 Any professional working a total of 20 or more hours per week, at one or more MDPH certified in an early intervention program(s), as a staff member, consultant or fee for service employee, is required to complete an application for full certification; and become fully certified within three years of his/her date of hire. The CEIS portfolio is due on the last day of the month corresponding to the month during which you were hired, e.g. if you are hired on August 1, 2016, your portfolio is due on August 31,2019. At your time of hire, you receive a letter from the Department of Public Health advising you of your due date. For staff whose hours drop to fewer than 20 hours per week, the due date is adjusted: The time period during which your hours are reduced does not count toward your 3 year time frame, i.e. your certification “clock” stops ticking during that time period. If your hours increase again to over 20 hours per week your “clock” begins ticking again. You are expected to monitor your own hours to determine your due date. You may need to consult your program’s administration or human resources staff to determine exact dates for changes in hours. It is your responsibility to keep track and use this information in determining your due date. The CEIS manual is posted on the EI Training Center web site at www.eitrainingcenter.org. In addition to the entire manual, the portfolio cover sheet and the required sections for each entry may be downloaded separately. You may complete forms individually online, download them, and print them prior to submitting your portfolio. Applicants are strongly encouraged to complete the sections online. For staff members who want a printed manual, the Commonwealth of Massachusetts Health Promotion Clearing House will have a repository of manuals that may be ordered by individual programs. Further information regarding the process for ordering manuals from the clearing house will be made available within the next few weeks.